Windows 10’s Fall Creators Update includes the “My People” feature originally promised for the first Creators Update. You can now pin up to three of your favorite people to the taskbar and quickly chat with them on Skype or send them emails. This feature will only get more powerful as Windows Store apps integrate with it. For example, Windows 10’s Facebook app could one day integrate with My People, enabling you to Facebook chat with your favorite people right from your taskbar. It’s up to Facebook and other app developers to enable this, however. To access this feature, click the People icon on the taskbar. It appears to the left of your notification area, also known as the system tray. The My People menu will pop up, and you can click “Get started” to continue. 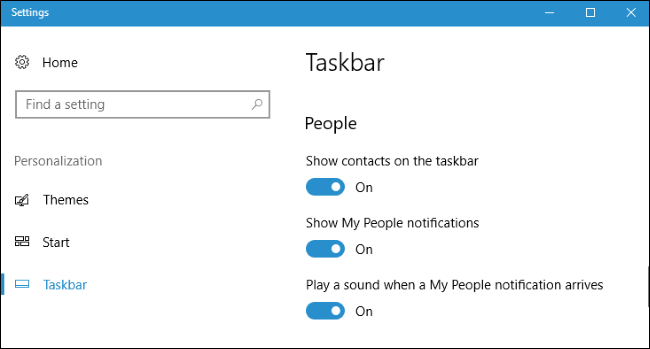 When you open the My People popup by clicking the taskbar icon, you’ll see an interface sorted into two tabs: People and Apps. 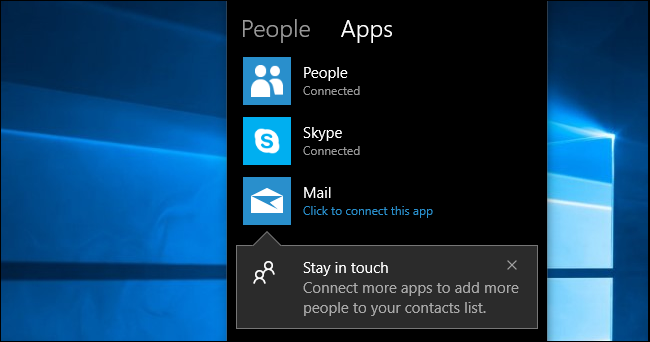 By default, Apps includes the People, Skype, and Mail apps included with Windows 10. Apps you install from the Windows Store can also integrate with the My People feature. If you install a compatible app, it will appear in the Apps menu here automatically. The People tab shows people from your contacts, You can make more people available here by connecting an account with the People app. For example, you could add your Gmail account and see your Gmail contacts here. Once you’ve connected some accounts, you can click the “People” heading to see suggested people you frequently communicate with. Click a contact here to pin it to your taskbar. You can also click the “Find and pin contacts” option at the bottom here to dig through your entire list of contacts. To add a new contact, head to the People app or click the menu button to the right of “Find and pin contacts” and select “New contact”. Once you’ve pinned a contact to your taskbar, it will always appear to the left of the people icon on your taskbar. To reorder your people icons, just drag and drop them. To remove one, right-click it and select “Unpin from taskbar”. 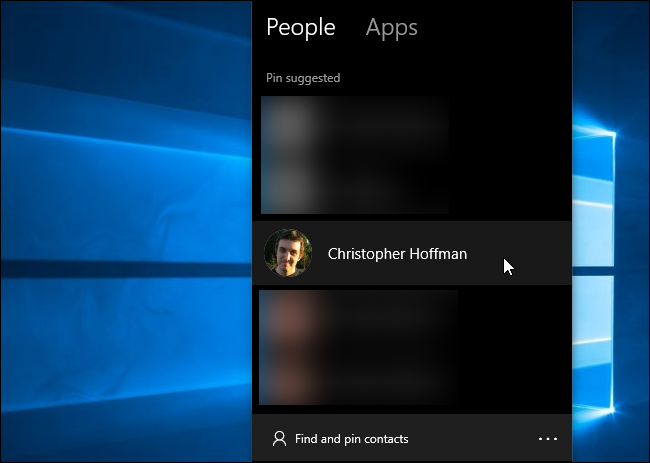 You can pin up to three contacts on your taskbar. Any additional contacts you attempt to pin will appear in the People popup menu. To actually communicate with a person, click their icon and you’ll be able to use any of the apps you have to communicate with them. By default, this is People, Skype, and Mail, so you can send the person an email or Skype message. Click an app to see messages that person has sent you through that app. For example, you can click “Mail” to see email messages that person has sent you. The popup also lets you combine duplicate contacts. For example, you can associate a person’s email address with their Skype alias, if they appear separated. You can also click the menu button and select “Edit Contact” to edit a contact’s details, although you could do this from the People app included with Windows as well. When you communicate with a person through the My People feature, you can send them a message without opening the full app. For example, you can click a person’s icon, select “Mail” to view messages from that person, and then click the “+” button to start sending them a new email. You’ll write the email right in the popup menu rather than opening the full Mail app. This is integrated with Skype, too, so you can chat with your favorite Skype contacts directly from the taskbar. And, when a pinned person sends you an emoji on Skype, you’ll see a large emoji appear directly above their taskbar icon on your desktop. These were previously called “shoulder taps”, but are now called “My People Pops”. To change this feature’s settings, open the People menu, click the menu button to the right of “Find and pin contacts”, and select “People bar settings”. You can also just head to Settings > Personalization > Taskbar and scroll down to the bottom of the screen. There are three options here, and all of them are enabled by default. If you disable the “Show contacts on the taskbar” option, the My People feature will be completely removed from your taskbar. Changing this option has the same effect as right-clicking your taskbar and selecting the “Show People button” option. The “Show My People notifications” option controls whether you see notifications when messages arrive. Disable it if you want to hide those notifications. The “Play a sound when a My People notification arrives” option allows you to disable the sound effect the plays when a notification arrives. It’s unfortunate that Microsoft never got that “Messaging Everywhere” SMS integration feature they originally announced for the Anniversary Update, as that would make My People even more useful. If you want to hide the icon, right-click your taskbar and uncheck “Show People button” to disable it.